How to get to Lhasa Tibet from Shenyang,Dalian, Liao Ning Province or other northeast China? Every year there are many foreign people travelling to Lhasa Tibet from northeast China such as in Shenyang, Harbin, Dalian, Changchun,Inner Mongolia, etc. As it is too far away from the far northeast to the west of China. There is no direct flight between Lhasa and these places. Here below, local Tibet travel agency tells you how to travel from northeast China to Tibet. get to Beijing or Xi’an first, and fly or take the train from Xi’an to Lhasa. There are trains or flights to Beijing and /or Xi’an from every city in northeast China such as Jilin province, Liaoning Province, Shandong Province, HeilongJiang Province, etc. For example, there is “G” or “D” Train between Dalian and Beijing, Shenyang And Beijing, Qinghuangdao, etc. 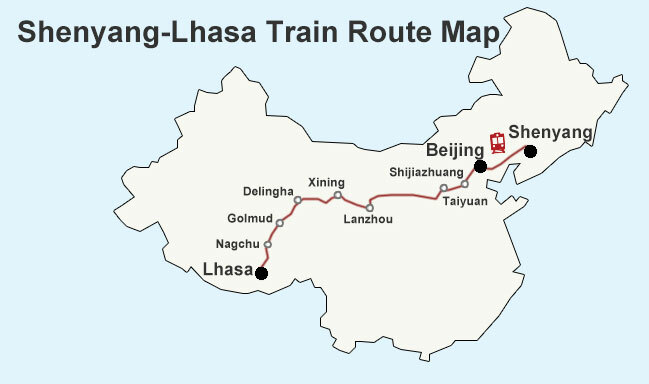 Since late last year 2016, there is train from Shenyang via Beijing for Lhasa. However, it is too long time train travel. We would even suggest travelers from Shenyang fly to Xi’ning and take the one day train travel to Lhasa. As you know there are most flights between Lhasa and Chengdu, Chongqing. It is even more convenient if you can get good airfare or train travel to these cities first and fly to Lhasa. Which is cheaper way for getting to Tibet from Shenyang or other northeast China cities? Train of course is the cheaper way for such long journey, but it takes too much time and you need to plan your schedule. Considering there are lots of people taking train, you’d better book the train tickets 30-60 days in advance. The ticketing schedule is subject to change. one way train and one way by flight. We suggest you fly to Lhasa in the lower season and take the train back to China in busy tour season. What Tibet Travel Document Should you need for travel from northeast China (such as Shenyang) to Lhasa, Tibet? This is a common question which we receive every year from travelers who are from these places. E.g, some of these travelers work as English teachers, or in FAW/BMW companies, etc. To travel to Tibet for foreign travelers, it is not difficult at all when you have the right Tibet travel permits information. Please refer to “Tibet Travel Permits” to learn more. Tony writes this Tibet travel blog, should you need any assistance for Tibet tour, welcome to contact with our Tibet tour agency. Next postHow to travel to Lhasa Tibet from Kunshan,Suzhou,Wuxi or Changzhou Jiangsu Province?